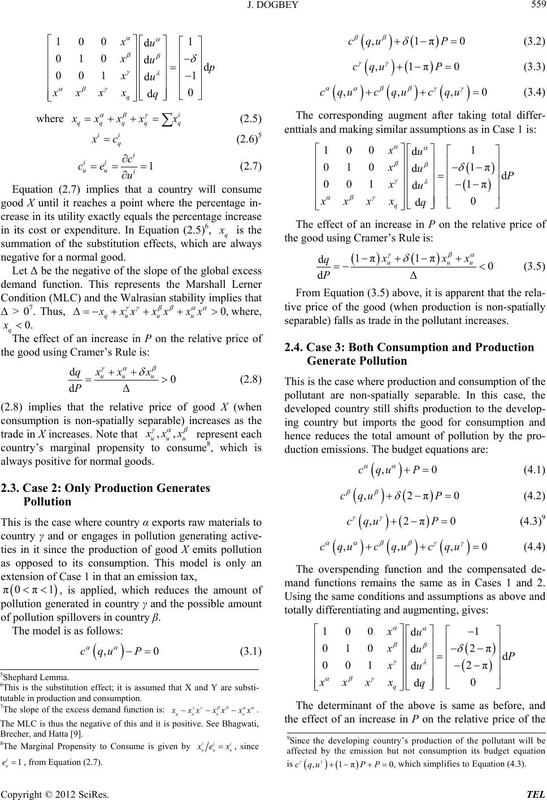 tions and compensated demand functions to analyze the terms of trade effects. of environmental policies have also been investigated. crease specialization in sectors that cause little pollution. tion once a country reaches a certain income threshold. spatially separable pollutants such as CO3, O3 and NOx. ship between pollution, trade, welfare and relative prices. trade with a developing country that is not its neighbor). good Y; good X is the pollutant. is its cost (expenditure) less its revenue. of good X by country . crease) if it is importing (exporting) good X.
and hence the smaller the value of the pollution transfer or spillover. and budget equation will be the same. 3By Walras Law, the market clearing equation of good Y is omitted. negative for a normal good. always positive for normal goods. 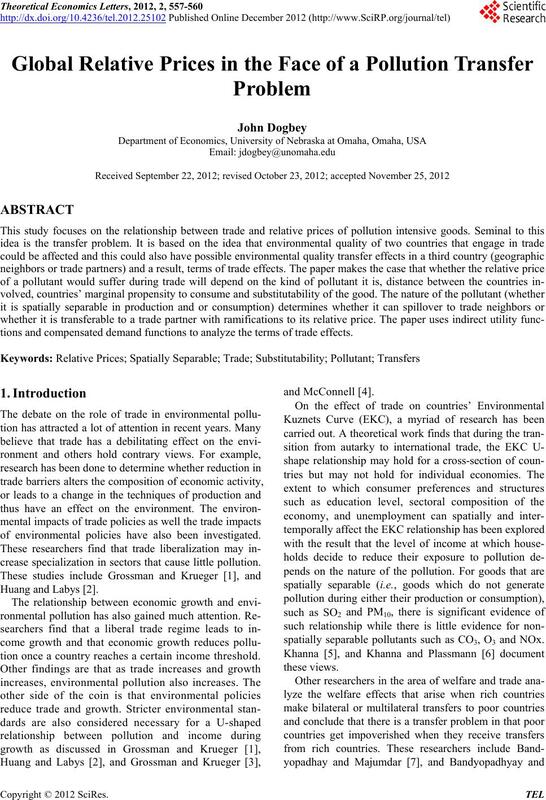 of pollution spillovers in country β.
separable) falls as trade in the pollutant increases. mand functions remains the same as in Cases 1 and 2.
tutable in production and consumption. which simplifies to Equation (4.3). production (Case 3) the relative price of the good falls. at least production have relatively lower relative prices. and hence the fall in the relative price of the good. ing Paper Series, MIT Press, Cambridge, 1991. Global Issues, Vol. 4, No. 4, 2004, pp. 242-266. 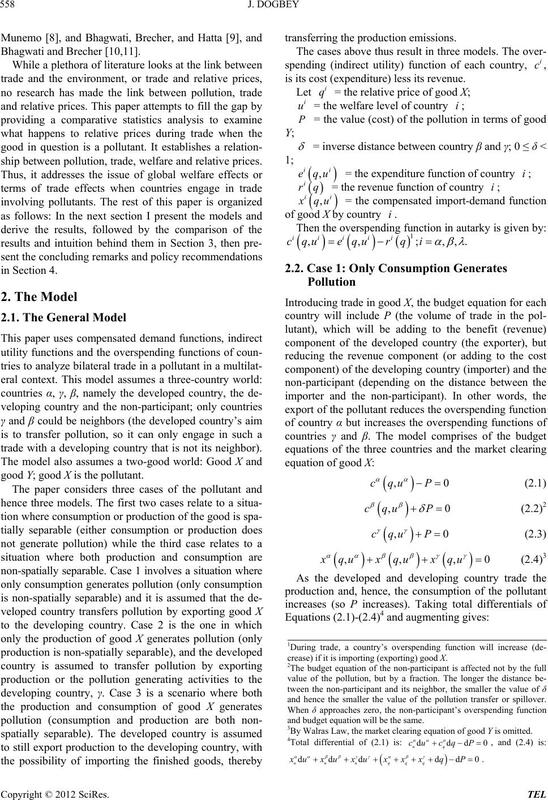 Environment,” The Quarterly Journal of Economics, Vol. 112, No. 3, 1995, pp. 353-377.
nomics, Vol. 2, No. 4, 1997, pp. 383-399.
velopment Economics, Vol. 73, No. 2, 2004, pp. 715-725.
ness and Economics, Vol. 5, No. 1, 2006, pp. 29-40.
nomy, Vol. 89, No. 3, 1981, pp. 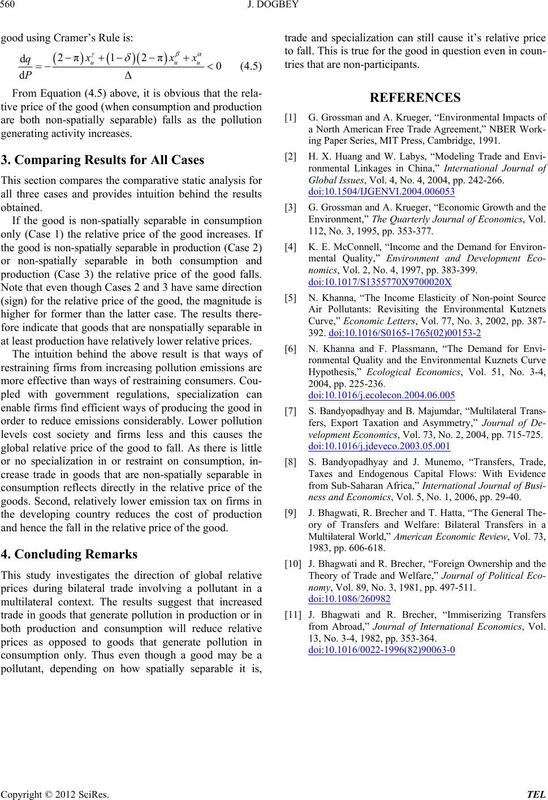 497-511.
from Abroad,” Journal of International Economics, Vol. 13, No. 3-4, 1982, pp. 353-364.